On a typical drab November day, Sutton Valence Vets found themselves with an unusually large squad of 16 players for their home match against Tunbridge Wells, including two guest players. One of the squad was lent to the opposition, who were short. The match began in competitive style with end to end play, but it was Valence who gained an early lead after 5 minutes when the Wells keeper let in a strong shot from John Kitchenham through his legs, thinking it had been hit from outside the dee. The two teams looked evenly matched but it was the speedy Wells forwards that looked more dangerous and shortly afterwards they responded with an equaliser. The game continued to be very competitive and a sequence of play in the Valence half led to some players becoming a little over-excited, before calm returned. Valence’s strong midfield continued to generate several opportunities to score, but goals failed to materialise and it was Wells who made the next strike late in the half to go one up at 1-2. Then in the final seconds of the half Nigel Bardsley provided a long pass through to Julian Mills in the dee, who controlled it well and despatched it past the Wells keeper to level the scores at 2-2.
scoring chances. The Valence defence, led by captain Hamish Dow, defended well, but there were occasions when they pressed too far upfield and gave the Wells’ forwards several opportunities, which were, fortunately, squandered. Then in the Wells dee, a shot on goal was parried by the keeper and Charles Worsfold at the left post pushed the ball into the goal with a deft one-handed reverse stick shot to make the score 4-2. Tunbridge Wells responded almost immediately when a shot hit the post and bounced out to a free player who had a simple task to score and make it 4-3. Both sides stepped up their efforts but it was another deflected goal from Charles Worsfold, stationed at the Wells’ right post, that settled the game to make the final score 5-3. 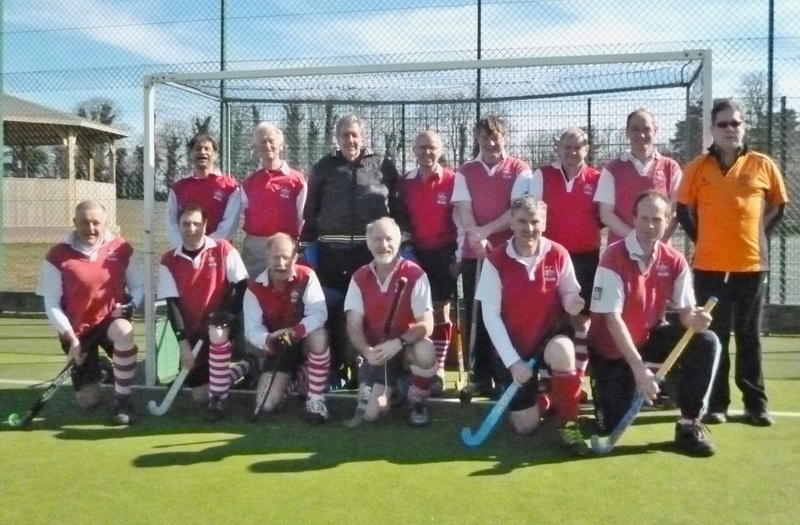 Jon Worsfold survived playing his first game of hockey for about 35 years. Afterwards, in the Queens’ Head, Grasshoppers presented the engraved tray which Sutton Valence Vets had won in the games played between them last season. Goal scorers: Julian Mills, Charles Worsfold (2), John Kitchenham, Martin Hadaway. Team: Dave Britton, Andy McVarish, Mike Nettle, Hamish Dow, Julian Mills, Paul Linaker, Lyndon Davies, Bob Sagrott, Charles Worsfold, Nigel Bardsley, Bob Bartlett, Stuart Bates, Jonathan Worsfold, John Kitchenham, Martin Hadaway. Sutton Valence’s Reuben Fielding played for the opposition. Next week the Vets are due to play Wimbledonians away on astro at 10.30.